ISO paper standards are widely used throughout printing. Originally for the litho and screen print industries where sizes need to be fixed, they are now used extensively in the large format digital printing market. One difference is many large format digital printers use rolls rather than sheets of paper. 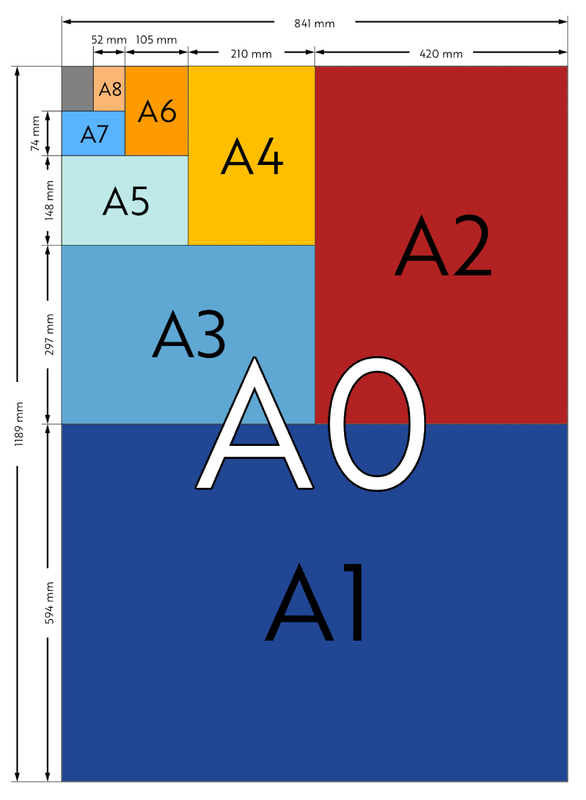 But graphics in products such as poster frames, billboards, pavement signs and Poster Frames come in popular set sizes, usually from the A or B series. European displays are metric where in the UK we still have imperial sizes such as 20" x 30". Select your size and units in the drop downs below and the dimensions in the paper size calculator will update automatically. Double Quad Crown 60 x 40" Elephant 28 x 23"
Quad Demy 45 x 35" Super Royal 27 1⁄2 x 20 1⁄2"
Quad Crown 40 x30" Double Foolscap 27 x 17"
Double Demy 35 x 22 1⁄2" Royal 25 x 20"
Quad Foolscap 34 x 27" Medium 23 x 18"
Double Large Post 33 x 21" Demy 22 1⁄2 x 17 1⁄2"
Double Post 31 1⁄2 x 19 1⁄2" Music Demy 20 x 15 1⁄2"
Imperial 30 x 22" Crown 20 x 15"
Double Crown 30 x 20" Post 19 1⁄4 x 15 1⁄2"
- - Foolscap 17 x 13 1⁄2"